Automation News and Press Releases - Axis Inc.
“Swarm” robotics sounds like the stuff of science fiction, but it may actually be the future of the manufacturing industry. 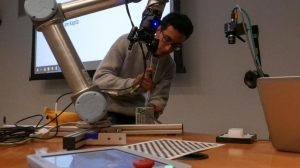 As NYU Tandon Professor Vikram Kapila told the group of manufacturing professionals gathered for the summer’s third OPS21 Robotics Awareness Workshop, swarm systems make integrating robotics into an industrial workplace safer and more efficient. Using LiDAR, robots that are part of a “swarm” on a manufacturing or warehouse floor can identify not only human workers and obstacles around them, but also each other. 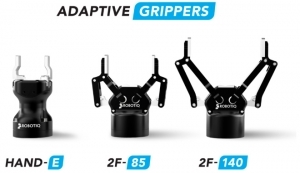 What’s more, adds Professor Kapila, “Using these kind of robots has become easier and more cost-effective given advancements in cheaper sensors, embedded computing, and machine learning.” Other advancements, in areas like blockchain technology, allow robots in obstacle-ridden industrial settings to gain global awareness using minimal sensing and distributed computing. 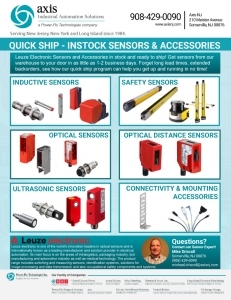 Leuze Electronic Sensors and Accessories in stock and ready to ship! Get sensors from our warehouse to your door in as little as 1-2 business days. Forget long lead times, extended backorders, see how our quick ship program can help you get up and running in no time! The 3RW52’s are now “Released for Sale”. The 3RW5 family of soft starters extends our product range with market leading technology-features for practically every user application. 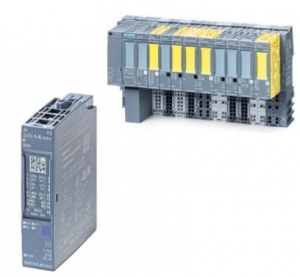 The existing 3RW30 and 3RW40 soft starter family will remain for sale, giving us one of the broadest packages available on the market! The 3RW5 family is a game changer allowing us to broaden our market leadership in mo-tor control applications. 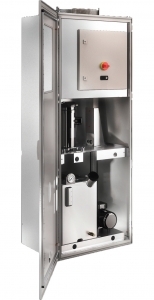 Compact size – Less than 8” deep up to 400HP, easy to fit into MCCs, shallow cabinets and retrofits. 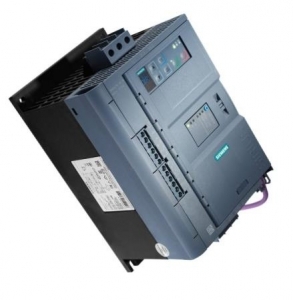 Flexible HMI choices – Install the high feature, standard, or omit the display based on the application requirements. From standard applications to high-tech solutions – Leuze has a sensor product for every application, many are available with IO-Link capability ! Measuring Sensors: Measuring sensors (analog or digital output) can actively check distances, position system parts, and monitor other part or target parameters. Teledyne DALSA’s Linea ML was awarded Gold-level honors in the Fourth Annual Vision Systems Design Innovators Awards. Recognized as an industry leader, the Linea ML is a breakthrough in line scan imaging, allowing systems to image multiple fields in a single pass. For automated inspection, Teledyne DALSA’s innovative machine vision technology also includes robust and flexible industrial vision systems and sensors designed to satisfy a broad variety of user requirements to ensure product quality on the factory floor. These systems are compatible with a wide range of cameras for both area and line based imaging including Teledyne DALSA’s Gigabit Ethernet and Camera Link® cameras with mono or color sensors, as well as 3rd party alternatives. 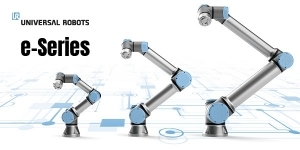 A repeatability of 30 micron (0.03mm) in the UR3e and UR5e models and 50 micron (0.05mm) in the UR10e means e-Series cobots rival or outperform competitors such as KUKA LBR iiwa (±0.1mm), Rethink Robotics Sawyer (±0.1mm), ABB YuMi (±0.02mm) and FANUC CR-4iA (±0.013mm). Re-designed user interface decreases cognitive load and expedites program development. Advanced users can utilize the new externally accessible, 500Hz system bus to implement more complex motion control algorithms or profiles. 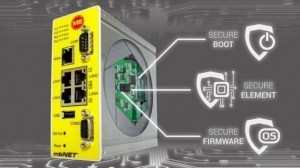 New wrist-joint-tool communication interface reduces production line integration time and the hassle associated with routing cables between the end-effector and control cabinet. These chillers benefit from the latest advances in thermodynamic efficiency, most readily apparent in the repositioning of the unit’s condenser fan. Based on proven Rittal modular designs, these chillers can be customized to fit your specific requirements – and provide cooling capacity from 30,000 to 150,000 BTU. These models provide high efficiency and a level of cooling you’ve come to expect from Rittal on a footprint that is only 24 inches deep.